I truly hadn't realised there'd be so many hotels to choose from when it came to staying in the Lake District. 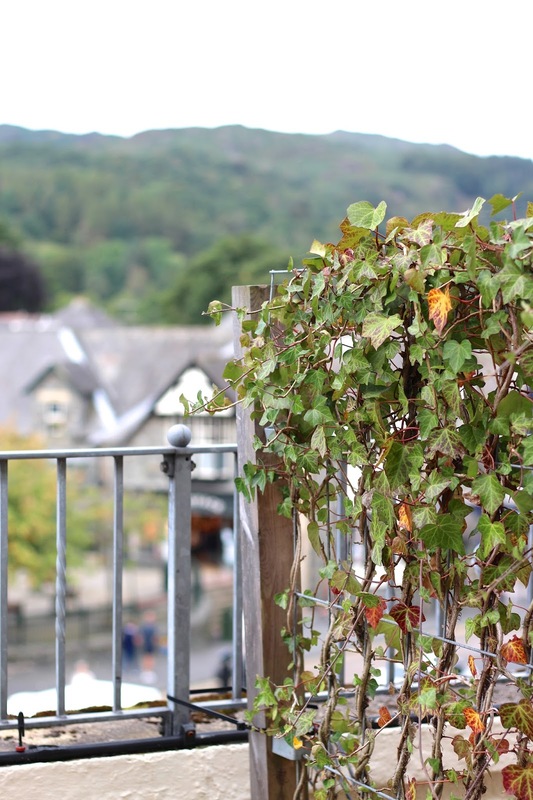 However considering the main area of interest was Ambleside, it made sense to stay in the heart of the town - that way, you already find yourself at the starting point of some of the most popular walks (such as the Coffin Route, seeing you go from Ambleside to Grasmere - more on that in Part Two!). 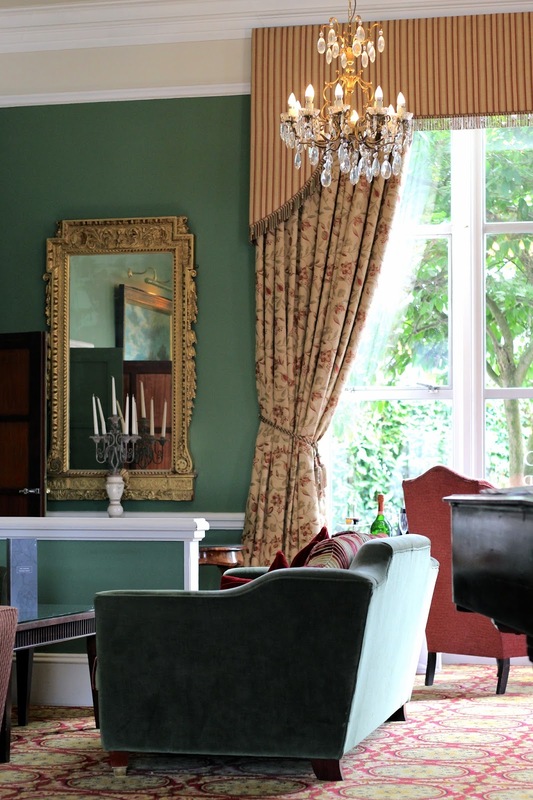 With this in mind, the highest-rated hotel in town is the Ambleside Salutation Hotel; a modest but comfortable and very welcoming hotel, set in a 17th-century building. 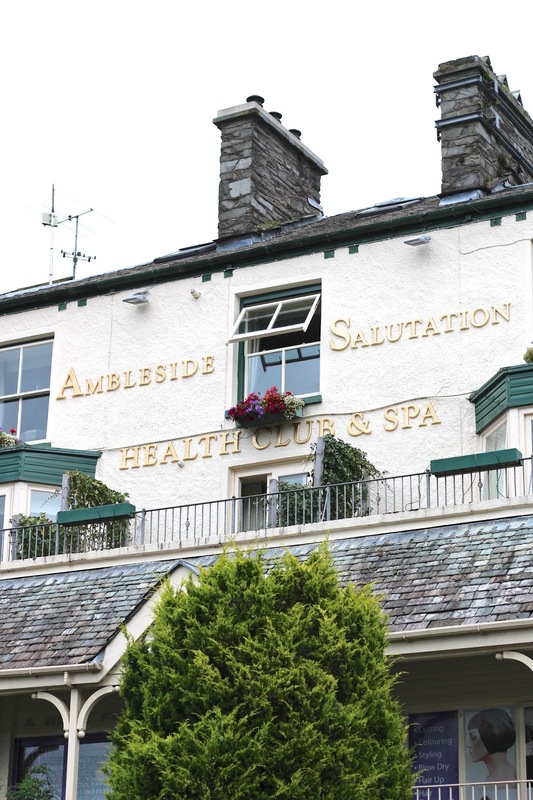 Having made the day-long journey with relatives (dropping some off elsewhere for a - kind of insane - week-long trek), the warm and inviting welcome by the Ambleside Salutation's reception was like a breath of fresh air. Speaking of fresh air, the balcony did a pretty good job on that front too! Although I'd planned on completely slowing down, most days were spent hiking over hills and marvelling at just how wet one person can get. Very, is the answer to that - the Lake District's weather doesn't care about your blow-dried hair, trust me. After just 24 hours, it began to feel as though I'd lived there my entire life; there's something addictive about the area's nature-loving, laid-back vibe. You can't help but fall into step. Though, something far removed from the fields of sheep and yet going entirely hand-in-hand with the concept of relaxation, is afternoon tea. 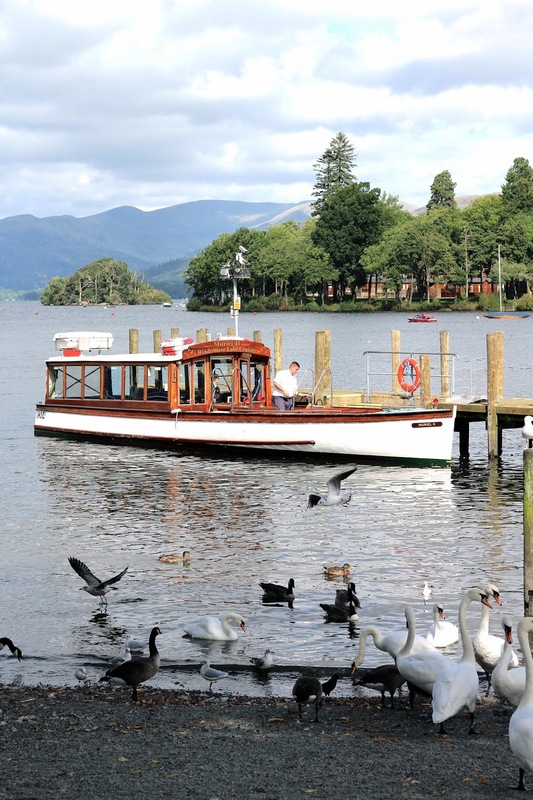 Having heard great things about those served at the Macdonald Old England Hotel & Spa in Bowness-on-Windermere, a 30-minute boat journey was needed via Windermere Lake Cruises to reach the Cumbrian town. 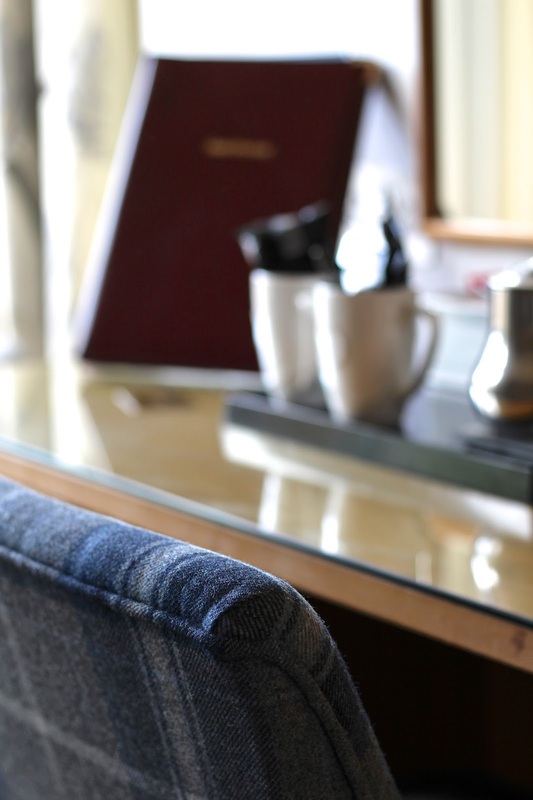 In such a popular (read: crazy busy) town, the Macdonald Hotel feels like a luxurious oasis, the perfect spot for some lakeside sandwiches and scones. Note: shown here is the Afternoon Tea for Two. 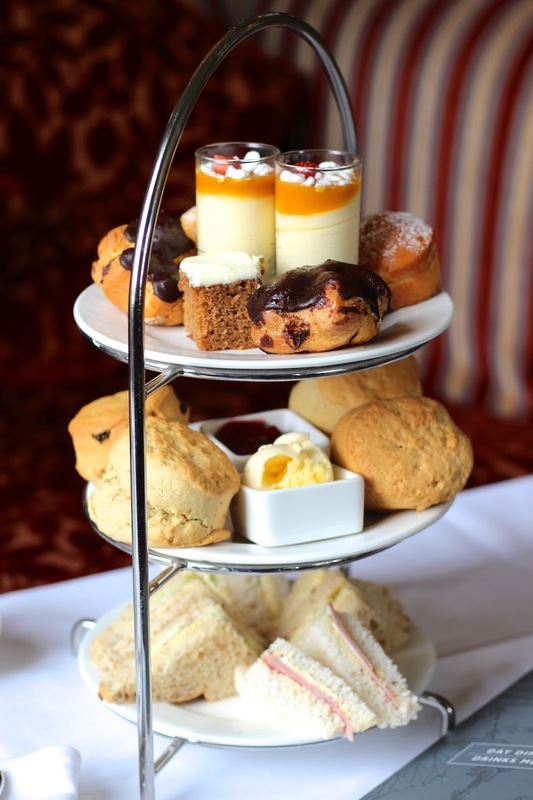 Unless you have massive appetites, the Afternoon Tea for One could easily feed two people. 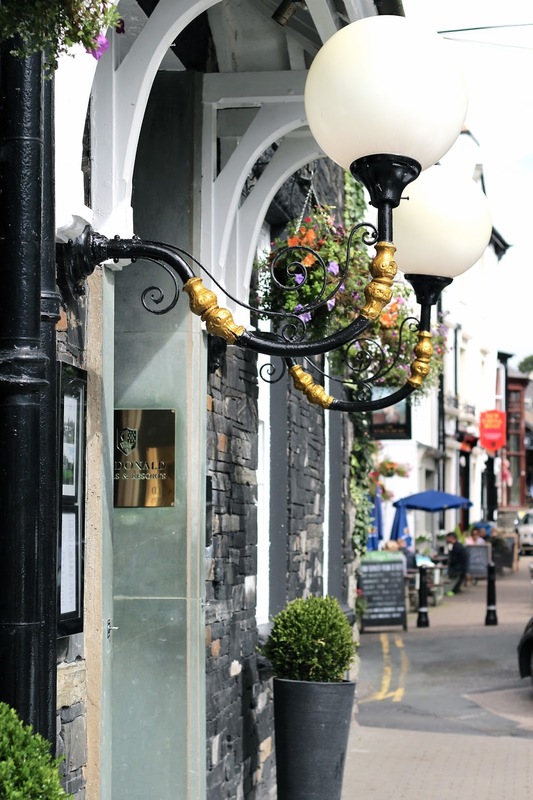 This was undoubtedly one of the slower-paced days, those that consisted of food, shopping and boat-hopping - something Bowness-On-Windermere knows a lot about, and caters to those that want it! The range of boutiques on the high street is incredible, with prices wildly varying from one shop to the next. Personally speaking, I stumbled across a really sweet salon that stocked all of the Clarins skincare products I'd forgotten to bring with me, as well as a gorgeous boutique selling the tweed jacket of my dreams. Although I didn't often take my camera out during the stay, I was sure to have it at hand when visiting the popular Sizergh Castle, as well as Rydal Mount (home of poet William Wordsworth) - both of which will be in Part Two! You know what, I may even throw in a photo of me marching ahead in a massive anorak, backpack and hiking boots. Fashion. 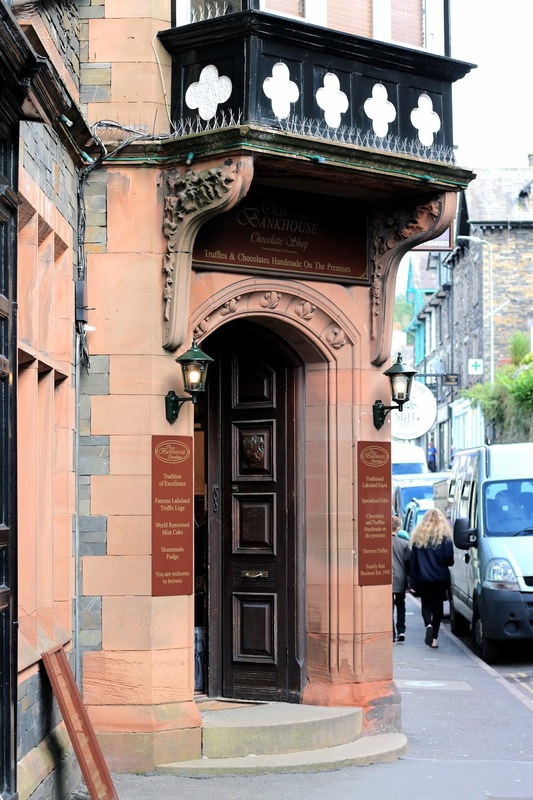 A chocolate shop at every turn...sounds like my kind of place! :) Great photos! Sometimes it's good to just revel in an experience rather than spend all your time trying to capture it in photos. That said, glad that you did take some of your time spent in the Lake District to share with us. It looks like one of those places that would probably be beautiful any time of the year. That place look,s so gorgeous. You look stunning! Wow! Beautiful and amazing pictures, you look so cute. How wonderful! Your photos are gorgeous Gabrielle. This looks like the kind of place to get lost in. I don't blame you for wanting to slow down a bit! This pictures are wonderful , that is a lovely place. We used to go here quite a bit when I was a child, very picturesque. Did you try the Kendal Mint cake bars? I got such a warm feeling when I spotted them (childhood memories), but I just can't bear the taste of mint!! I really want to visit here! It honestly looks so amazing! I must visit one day! I love the whole vibe! Wow, it looks so charming! I love the architecture, full of character. Now you've given me some major chocolate cravings, haha. I even narrowed in to see what the signs on the shop's front say, did you try their mint cake? I'm not particularly fond of mint, but I'm just curious, as it boast's it's "world renowned". The dessert tier looks AMAZING and of course the nature shots look beautiful, too. I seem to only be talking about the food, haha! Thanks for sharing, beauty, and did you get the tweet jacket? If so, I'd love to see you feature it on the blog! I hope you have an amazing weekend ahead! Hey Jalisa! As much as I love spotting Kendal mint cake, I don't actually like the taste of mint - eek! I think most of us keep a lot of moments to ourselves (bloggers included). I think social media has us falsely convinced that we must share everything when we all have our secrets and micromanage and control our social media presence by cherry picking the best moments of our lives. Plus I think it is generally healthy to have moments that are just your own. 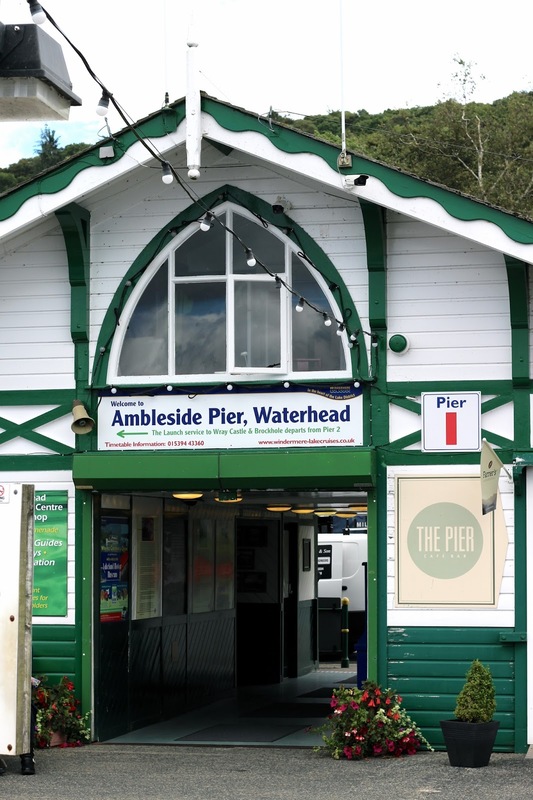 Ambleside is my favourite part of the Lake District I love it so much, we go for my boyfriend's birthday every year! I don't know which I like more...all the chocolate or the gorgeous views! Happy Weekend-Love the photos you took! I love the photo of the lake with the boat. And the chocolates look so delicious. so so lovely!!! perfect for an autumn weekend trip!! thanks for sharing dear!! Keeping some special moments and photos to yourself is totally acceptable, whether mentally or tangible images. I find myself doing a lot of that, lol. You've captured one of my favourite areas, Cumbria. The spa not only sounds incredible, but the food also seems like the perfect treat to enjoy upon arrival. Have a lovely weekend, Gabrielle. Lovely photos as always! I totally get why you would want to hold onto a moment just for yourself. We share so much and it's 100% okay if there are some things that you just want for yourself. We're not obligated to share anything more than what we feel comfortable with at any given time. Such a gorgeous place! The afternoon tea looks amazing! Do you study photography? Your blog is so refreshing I love it! Are you based in the UK? Hey Emma - thanks so much! No I'm self-taught :) I am indeed based in the UK. That hotel is beautiful! I liked your first part about keeping some memories to yourself. Sometimes I travel to places and I don't even blog about it because I want a trip all to myself, with memories that I don't share. It's nice once in a while. Can't wait for part 2! Lovely photos you've captured here! Hope you have a great weekend. It looks so pretty - that waterfall is so lovely too! You go to places that look like a set for a movie...or an inspiration to a cartoon series I used to watch as a kid. Ah. Nostalgia. 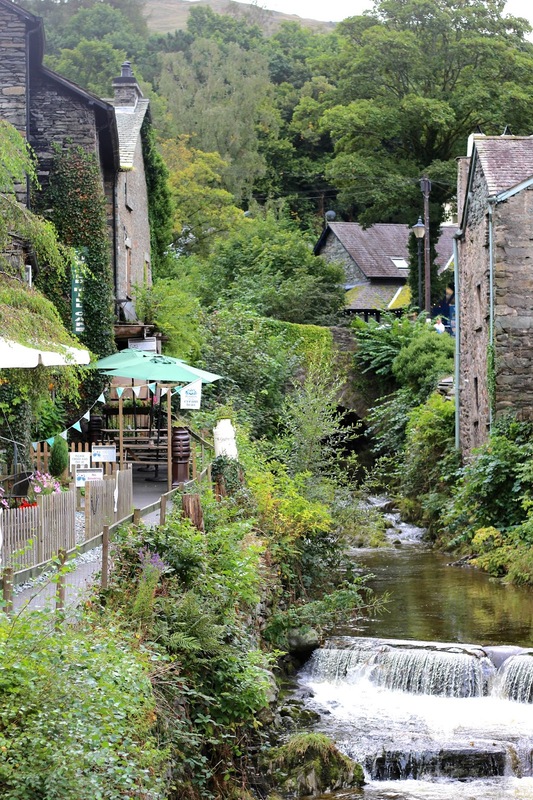 Really lovely places, and great food! Thanks for sharing your travels and experience. Gosh, you make me crave for a vacation at a quiet country side, Gabrielle. i don't think I've ever tried a proper afternoon tea in a hotel before but it sounds like an experience that I should try at least once in my life. I can definitely relate to wanting to keep something for yourself, especially such a gorgeous trip! Boat-hopping sounds so wonderful! Looks like a beautiful place! Thanks for deciding to share it with us after all. Happy weekend! I've been wanting to visit Lake District for more than a decade....I've became fascinate with it ever since I started reading and studying about Lake District poets ( which was when I was an adolescent because that is when our schools' curriculum get a bit more serious about literature study)...but I must admit that even today most of the images of Lake District I have in my head are those of old paintings, despite the fact that I did see some documentaries about it in the meantime. It was very refreshing to see your 'modern take' on it. For example, I had no idea that they had they chocolate game on! Well, that certainly makes me want to visit it all the more. In addition, I didn't know there were so many hotels to choose from. That hotel you have chosen is wonderful. You look as lovely as ever.....I really like the ruffles on that grey jumper. Such a cute casual outfit! btw I know what you mean when you say that you like to keep some things for yourself. 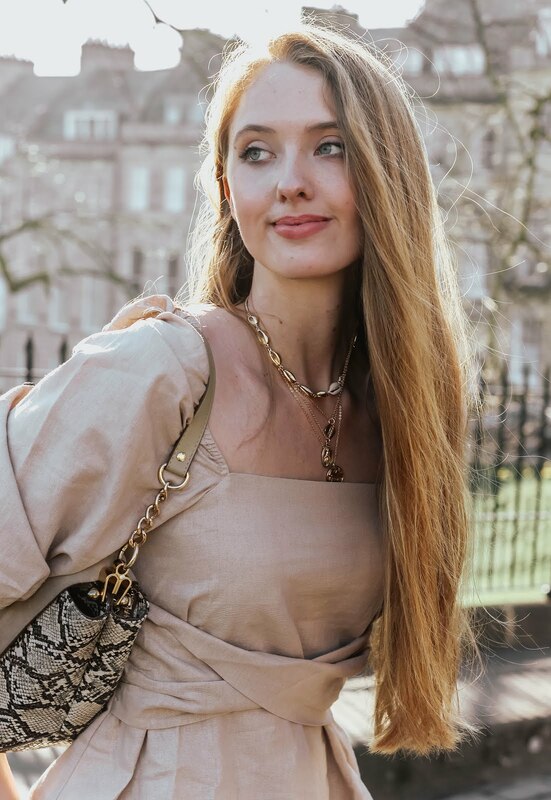 I have tons of outfit and travel posts that I didn't post and not just because I can't find the time to write something about them (life kind of hectic lately) but because it is kind of nice to enjoy images and places by yourself...even if one is a blogger! Well, I think blogging doesn't have to be like a reality show. I think it is great to take some time to reflect on what we want to write about it. That way our posts can actually be even more relative...not everything has to be about posting 'the latest' news. We're (most of us bloggers) more complex than that and that's actually a good thing and an indication that we care about blogging on some deeper level..not just on that 'snap, post, count the likes' level. Amazing photos, and the chocolate looks delicious! Lake District looks so peaceful! I would love to spend a weekend or even just an afternoon there! To be honest with you, I prefer trying to enjoy the moment rather than trying to capture the perfect photo with a camera in my hand. But we, as bloggers, should have it always handy. Love the photos! The Lake District looks like a place I would love to spend exploring, but mainly just going from chocolate shop to chocolate shop =o) yum! Sometimes keeping a moment to yourself is all that is needed to completely slow down. I tend to do that as well from time to time and share after I returned. That way I don't feel the pressure to perform throughout the trip. Absolutely beautiful pictures! The first one is so dreamy - I simply love the countryside. Have a great weekend! What a gorgeous area! Everything is so pretty and charming! Ooh, those cakes! In love with the last photo! During my student years in London, friends of mine would travel up to Lake District but I never went. Wish I had! The place looks incredibly beautiful. It looks beautiful, not to mention relaxing. This place looks like it came straight out of a fairy tale...It's so beautiful! 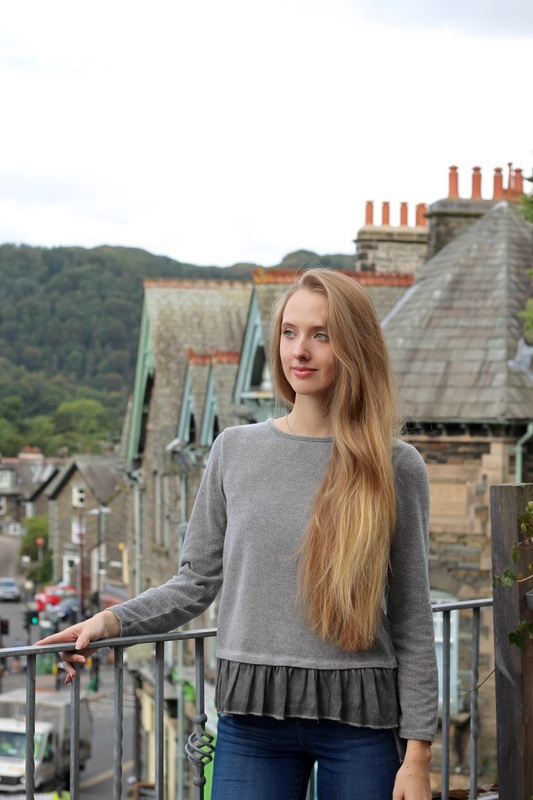 I've always wanted to go to the Lake District - your pictures look stunning! Also HOW CUTE is that hotel?! I love the lake district ! I often went with my family when I was a child and it was so so beautiful and we went to every peter rabbit attraction going hehe :) That really is an absolutely gorgeous hotel and I love the look of that afternoon tea :) I hope you have a beautiful week honey and i can't wait to read part two ! That looks like a gorgeous place to visit . So pretty! This is soooo lovely and wonderful! Simply gorgeous photos, Gabrielle! Love seeing such beautiful places! Getting ready to read part two! I hope I can make it to the Lake District someday. It really looks and sounds like a place I'd love! This is one of dream destinations! Thank you so much for sharing!! I've been planning a trip for ages! Stunning photography Gabrielle! Thank so so much for passing by my blog today and introducing me to yours! Although I can't say I'd really enjoy the rain, the Lake District does look like a beautiful place to visit! And the chocolate and high tea you had are definitely my thing, along with the beautiful scenery.